This is what Army West Point assistant football coach Tucker Waugh had to say after making it public that he has Parkinson’s disease earlier this month. 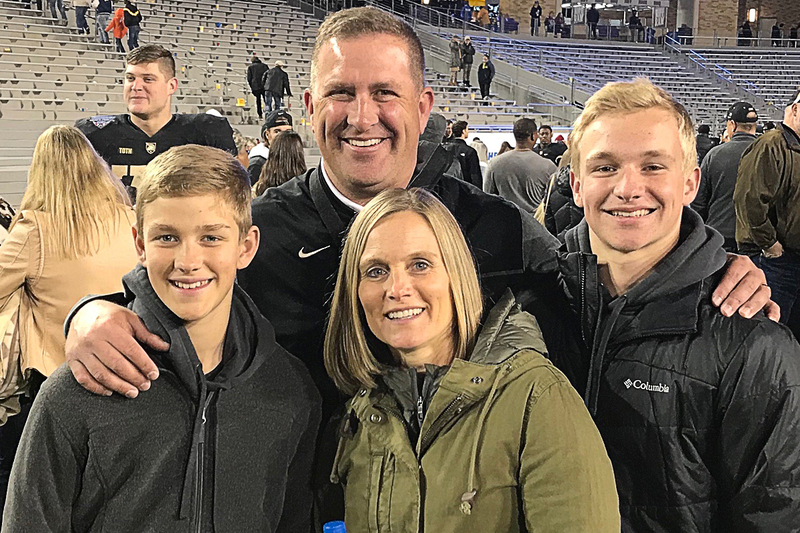 The slotbacks coach and recruiting coordinator is attacking it head on, though, and not letting it affect him as a coach, mentor, father or husband. Embarking on his 17th year on the coaching staff at West Point, Waugh is revealing the battle he has been undertaking off the field for a few years now. According to the Parkinson’s Foundation, Parkinson's disease (PD) is a neurodegenerative disorder that affects predominately dopamine-producing (“dopaminergic”) neurons in a specific area of the brain called substantia nigra. Symptoms tend to generally develop slowly over years. The progression of symptoms is often a bit different from one person to another though due to the diversity of the disease. Parkinson’s has by no means affected Waugh and his ability to coach and inspire the players, coaches and others around him here at the Academy. Waugh has not missed any time on the practice field or up in the booth during games over the past couple of seasons. 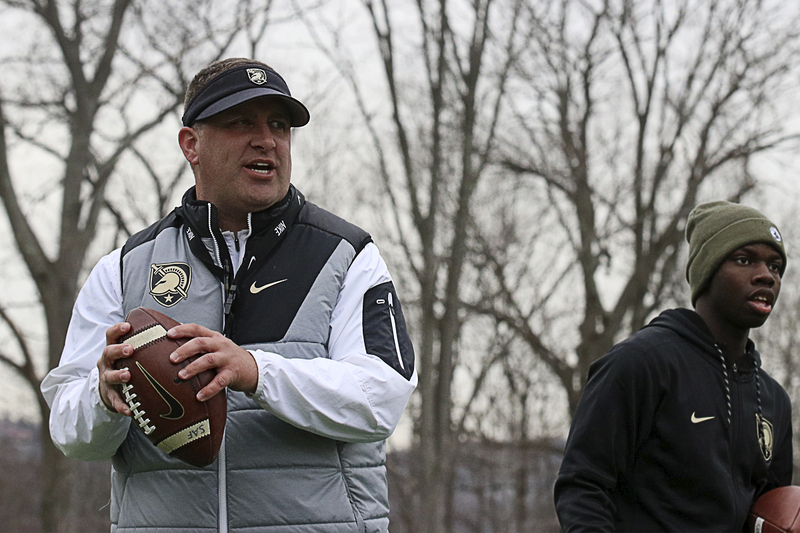 He has helped Army achieve some incredible feats the past two years, and has coached and recruited some of the top players to ever put on the Black and Gold uniform. He was a key member of an offensive staff that guided the 2017 Black Knights to the top of the Football Bowl Subdivision charts in rushing yards by averaging 362.3 yards per game. 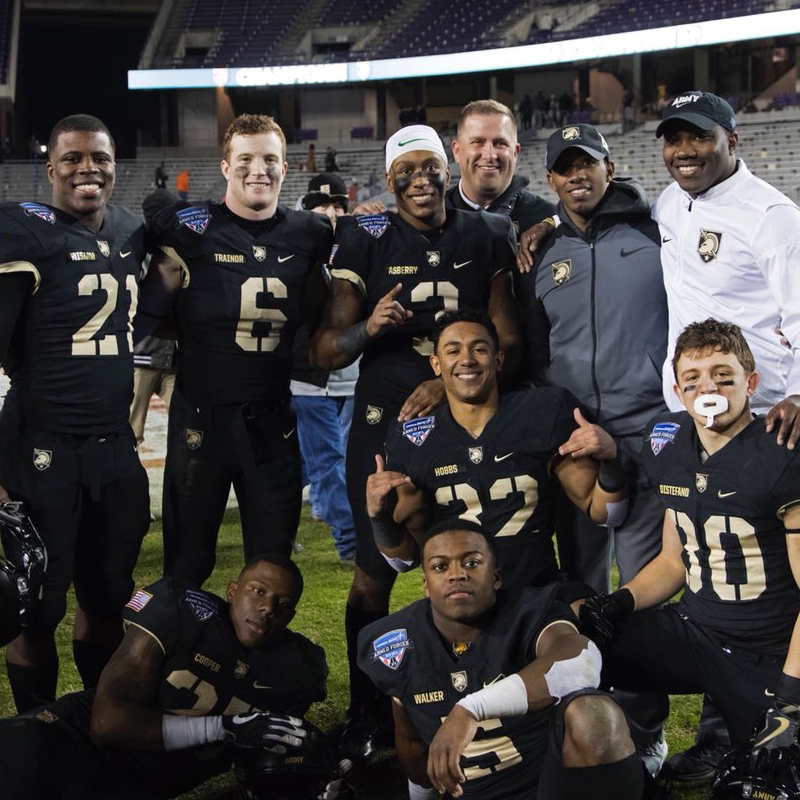 Army led the country in total rushing yards with 4,710 on the season and broke its 2016 rushing touchdown record with 50. 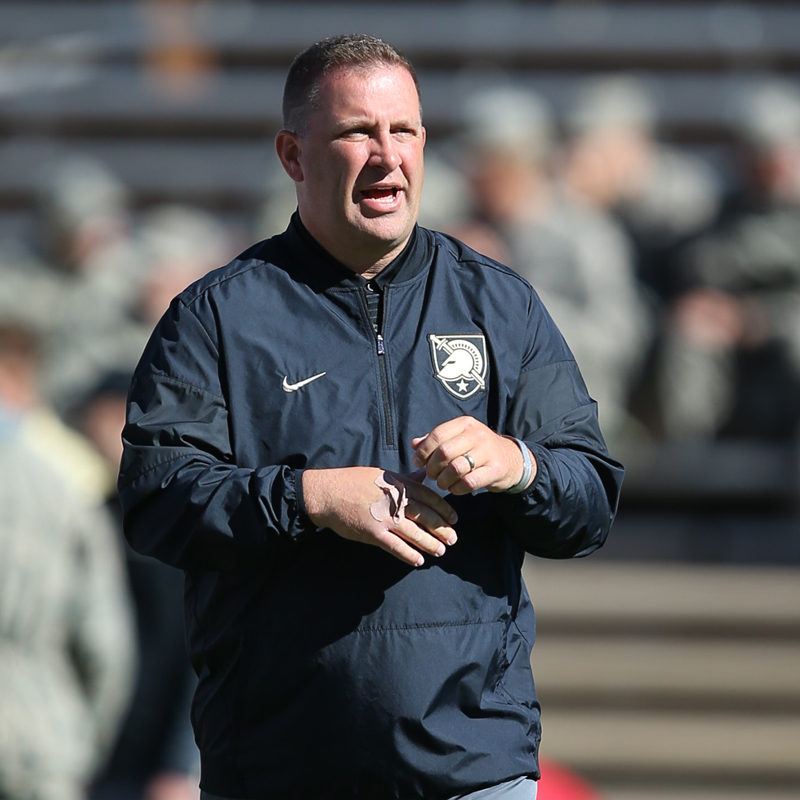 Army head coach Jeff Monken praised Waugh for his commitment to his team, coaching staff and the Academy. When asked if he thought it would slow Waugh down as a coach, his response was simple. It has not affected his energy, passion, or ability to do his job. The players he has coached over the past few years agree with their head coach. Waugh is a hardworking mentor that has a spirit and love for the game. This condition hasn’t slowed him down. When he shared with his players about how it could affect him and how it could affect his family, he never complained about it. He never mentioned to them that it was a disability. It is something that he has and that he is going to have to roll with. He is going to be the same coach and mentor either way. “He has a great attitude about it so that makes us as a group have a positive attitude about it,” Walker added. Rising sophomore Fred Cooper has benefited from having Waugh as his slotback coach more than most. “He is a father figure for me,” Cooper said. “I don’t have a father in my life, so he plays a big role. He makes sure he is around to keep me up and motivated. If I am having a bad day, he makes it better and is around me a lot. Walker and Cooper have been one of many that have learned from Waugh, and they all agree that Parkinson’s has not slowed him down. Monken, who competed against Waugh many times on the recruiting trail while at another academy, always saw him as a professional. 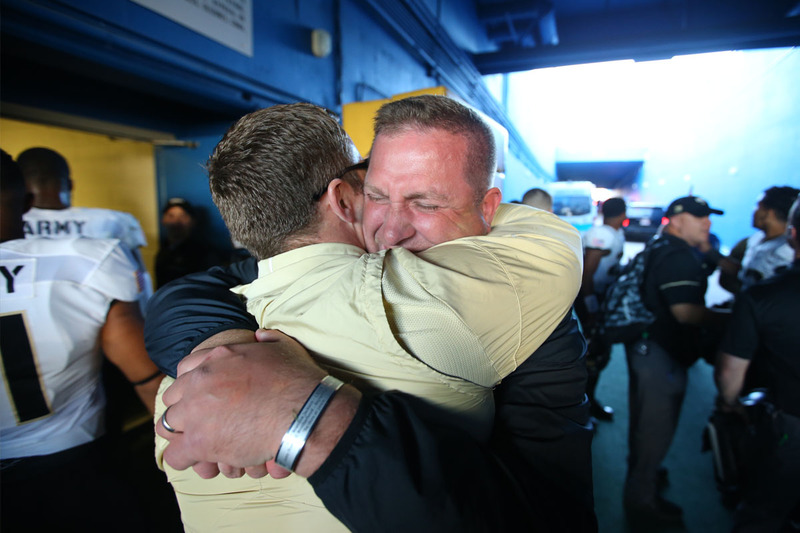 They may have butted heads during those years, but Monken never felt spite toward him and always thought he was a good guy who did it the right way. Coaching has been a love of Waugh’s for as long as he can remember. His dad was a coach and his brothers are coaches. He has a real passion to coach, especially here at the Academy. Waugh’s top support group in his battle has been his family. His wife, Jen, and their two sons Jackson and Nick, have been there for him since day one. Waugh is also part of the larger West Point community. On many nights during the season after practice you will see Waugh working on throwing, catching and route running with Jackson and Nick. His family has been on road trips, enjoyed wins over Navy and celebrated bowl victories in Texas. He has been blessed to have them along for the journey as he battles Parkinson’s. 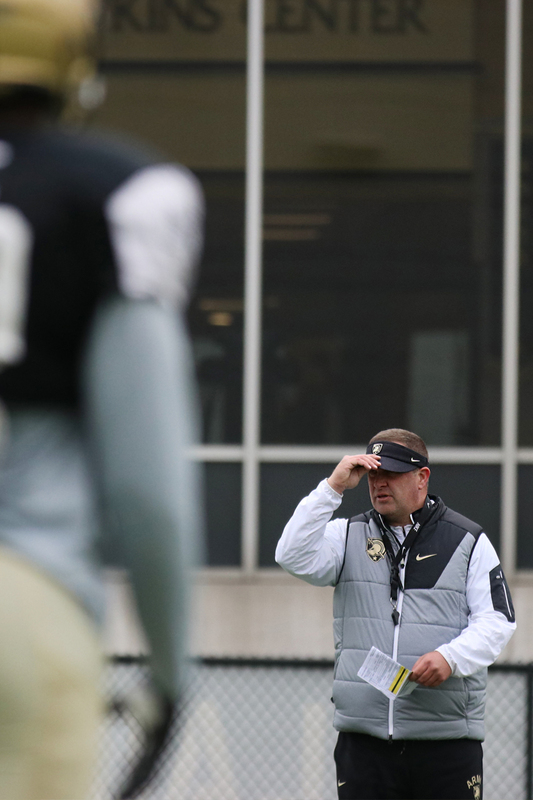 This spring, Waugh has been back out on the practice field with the Black Knights. That same coach is helping to prepare the team for their upcoming Black and Gold Game set for Friday night. The support system Waugh has at West Point is second to none.